Come join our annual Summer Tennis Camp at the award winning Pointe-Hilton Resort at Squaw Peak located at 16th Street and Northern in Phoenix, Arizona. 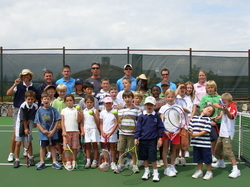 This beginner through intermediate camp offers weekly sessions from 8am - noon, Monday through Friday for children age 6-17. Our 14th annual camp starts off with an hour and a half of professional tennis instruction, drills and exciting games with our USPTA certified staff. Next, the campers will enjoy and healthy snack and iced cold drinks poolside. Last but not least, our staff will guide them through the Hole-in-the-Wall River Ranch where they will cool off in a variety of water features that include tubing on the Lazy River, water sliding, water fall swimming, and staff water games. Once or twice a week, campers will also play 18 holes of miniature golf. This camp is a must do for all skill levels and it fills up quickly. Each week, there are only 24 spots available and is offered on a first come, first serve basis. Multiple family discounts are 10%for the second child and 15% for a third. Plus, refer a friend who has never attended our camp and receive a 15% discount on your registration. To register, simply choose an option below and submit payment. After checkout, you'll be navigated to the Contact Me form. Please provide your child's full name, DOB, skill level, and cell phone number.